Time: 12:30 - 7 pm followed by dinner (buffet) on the house. Entry Fee RM 20.00, Open to all, and you are to be at the venue before 12. Those who wish to bring along their Hari Raya cakes are welcome !!! Lets get together for Hari Raya !!!!!!!! Venue: Bilik Seminar, Kolej Tun Hussein Onn, L 01, UTM, Johor. Non-Johorean can taking part but only can win the prize, no in representation. limited to 60 players only. Twenty two (22) chess players had participated in the just concluded Hari Raya Classical Chess tournament organized by Jax Tham. It is a very commendable effort by the organizer for such tournament since classical chess tournaments are very rare in Malaysia. The six rounds tournament just ended today and Jax Tham himself, ranked second to Abdullah Che Hassan won the tournament by winning 5 games and drew with Abdullah in the third round. The latter just managed to score 5 points because he drew his final round againts U12 Selangor state player, Roshan Singh. 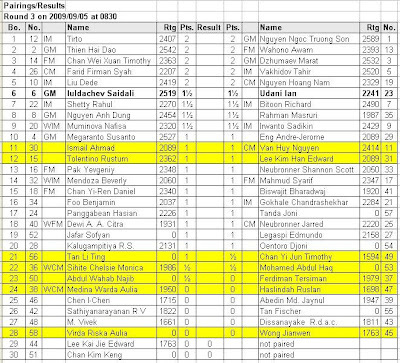 Seeded sixth with national rating of 1492, Roshan, edged other higher rank players such as Perakian Mark Siew (1692) and Chong Kwai Kun (1569). Eventhough Roshan lost to the eventual champion in the first round, he defeated both of them in the fourth and fifth round respectively. What an achievement for the young and talented Roshan in this tournament. With 4 points, both Joshua Foong and Andrew Soong, were placed fourth and fifth respectively. While the former lost to the top two seeds, the latter was defeated by the fourth and fifth seed. 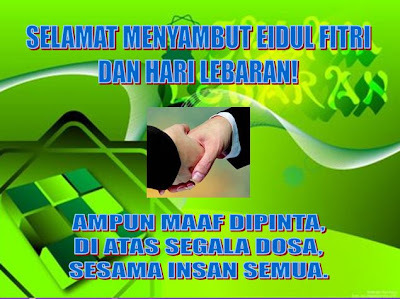 BERSEMPENA DENGAN KEDATANGAN SYAWAL BEBERAPA HARI LAGI, GILOCATUR INGIN MENGUCAPKAN SELAMAT MENYAMBUT HARI LEBARAN ATAU EIDUL FITRI BAGI TAHUN 2009 INI KEPADA SEMUA MUSLIMIN DAN MUSLIMAT TERUTAMANYA PEMAIN-PEMAIN DAN PEMINAT-PEMINAT CATUR. SEMOGA BERBAHAGIA DAN BERGEMBIRA DALAM RAHMAT DAN REDHA ALLAH SWT. PANDULAH DENGAN SELAMAT. INGAT ORANG TERSAYANG. INSYA ALLAH, KITA BERSUA DI PERTANDINGAN-PERTANDINGAN CATUR SELEPAS HARI RAYA. GiLoCatur dan keluarga akan pulang ke kampung esok pagi selepas subuh. Sejam yang lalu, GiLoCatur telah selesai membereskan segala urusan dan keperluan kucing-kucing GiLoCatur sekeluarga. Begitulah kebiasaan GiLoCatur bila pulang ke kampung atau bermalam di luar kawasan. Kami ada 12 ekor kucing Siam jenis soaked. Comel, siibu kucing, ada 8 ekor anak dari 3 generasi (batch). Brownie dan BB dari generasi kedua. Dua adik-beradik mereka telah mati. 3 ekor anak Comel dari generasi pertama semuanya mati sewaktu masih kecil. Comel, Brownie dan BB tidak dikurung di dalam kandang. Ini kerana kandang akan terlalu sesak. Tambahan pula Brownie dan BB tidak boleh berdekatan kerana mereka akan bergaduh. Mungkin disebabkan mereka telah menjadi kucing jantan dewasa. Tetapi GiLocatur sekeluarga tidak risau kerana mereka tahu untuk pulang ke rumah. Apa yang perlu GiLoCatur lakukan ialah dengan menyediakan makanan mereka di luar dan belakang rumah. Labu, Putih dan Manja dari generasi ketiga. Labu dan Putih dikurung di dalam kandang bersama 3 ekor adik-adik mereka, Binky, Dinky dan Blackie atau GiLoCatur suka panggil Hitam sahaja. Manja, satu-satunya kucing betina selain ibunya, Comel, terpaksa ditinggalkan di dalam rumah. Ini dalah kerana Manja baharu sahaja beberapa hari yang lalu melahirkan 3 lagi anak kucing. (GiLoCatur belum pasti apa jantina baby-baby kucing tersebut). Petang tadi, GiLoCatur sekeluarga berbuka di luar iaitu di BOB's Restoran di Seksyen 18. Kami terpaksa berbuka di luar kerana tidak sempat berbuka di rumah setelah mengambil Fikri dari asrama. Dalam bulan Ramadhan ini, GiLoCatur amat jarang berbuka di luar semenjak beberapa tahun yang lalu kerana lebih selesa berbuka di rumah. GiLoCatur hanya berbuka di luar sebanyak 3 kali sahaja termasuk petang tadi. Malam tadi GiLoCatur berbuka di sebuah hotel di Subang Jaya. Sebelum ini GiLoCatur berbuka bersama keluarga juga di Seksyen 18 sewaktu mengambil Fikri dari asrama. Petang tadi pengalaman kami berbuka agak mengujakan kerana hujan turun dengan lebatnya. Kami terkena tempias hujan. Setelah berbuka kami bergegas ke kompleks PKNS. Setelah menunaikan solat maghrib di surau, kami berjalan-jalan dan window shopping. Nasib baik orang tidak terlalu ramai. Tidak banyak yang dibeli. GiLoCatur hanya beli kuih bahulu gulung dan sedikit dodol. *** That's all folks! GiLoCatur really needs to go to bed now since have to drive back to hometown very early tomorrow morning. ***. Surfing the internet, looking for interesting info, GiLoCatur found some from Susan Polgar's famous chess blog http://susanpolgar.blogspot.com/. "to first get the knights and bishops out to control the center of the board, to not move the same pieces twice in the beginning, and to put the king in a safety position." a) "Chess inspires logical thinking and decision-making"
b) "Every move is a change in circumstances like in real life. To have young people see changes is an important skill." c) ... and if chess were used more in schools, society would be better educated. Is 09.09.09 special to you? As of 09.09.09, this blog has passed 18,000 mark. GiLoCatur just wanna capture and record the moment of the unique date! Among the top four boards, GM Nguyen Ngoc Truon Son of Vietnam, GM Susanto Megaranto of Indonesia and GM Saidali Iuldachev of Uzbekistan won their respective games. On the third board IM Richard Bitoon of Phillipines and IM Tahir Vakhidov of Uzbekistan drew. 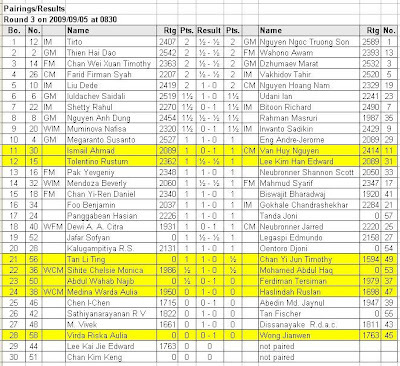 Therefore, GM Nguyen Son is the champion of the KL Open Chess Championship for this year's edition. If you notice all the top five winners are GMs and have 2500+ rating. What GiLoCatur can conclude that there is a difference between strong (masters) chess players in a tournament with other average and normal chess players. 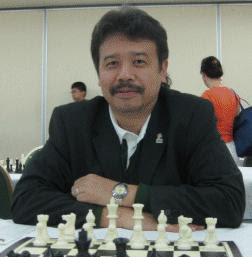 Average chess players especially to young Malaysian chess players should learn and emulate strong and master players. Tahniah or congratulation to GM Nguyen Ngoc Truong Son. 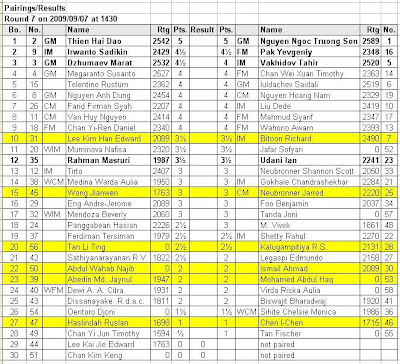 Indonesian FM, Syarif Mahmud could not manage to stop GM Nguyen Son to lead the pack with half point. On the other hand, the Uzbek champion, FM Pak, succeeded to earn half point by drawing with higher-rated GM Dao from Vietnam. Such result surely make GM Marat and GM Susanto happy when they managed to win their respective games on the third and fourth board. 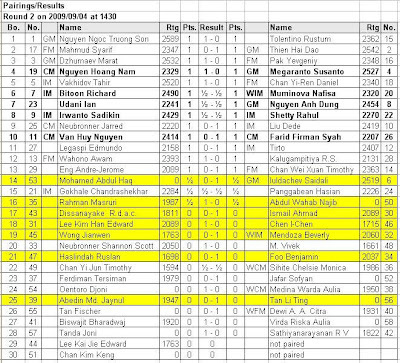 GM Marat defeated Singaporean FM Chan while GM Susanto beat his fellow countryman, IM Irwanto. In the Malaysian camp, Edward Lee, Najib Abdul Wahab and Abdul Haq Mohamed had sterling performances againts their respective opponents. Edward won againts an IM with 2284 FIDE rating, nearly 200 higher than him. 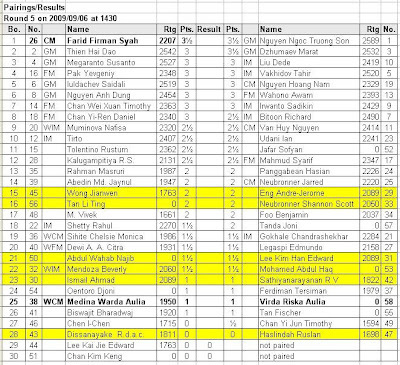 Najib managed to defeat a 1900-rated Biswajit Bharadwaj while Abdul Haq won againts rated countryman, Jianwen. In a battle of puteri catur between Malaysian and Indonesia, NWM Tan Li Ting could not manage to win againts one of the Indonesian Dream Girls quartet, WFM Dewi AA Citra. Whereas Ismail Ahmad drew with MCF's vice president, Haslindah. In the final round just began about half hour ago, it is back to the top four seeds. Leading the pack, GM Ngyuen Son plays white againts GM Marat Dzhumaev, the third seed on the first board. Having 6/8, both the second seed GM Dao Thien Hai (white) and the fourth seed GM Susanto Megaranto (black) will battle on the second board. GiLoCatur strongly believe the champion will be among these four GMs. 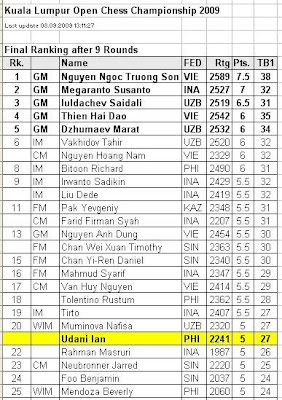 Edward Lee, the highest scorer with 4.5/8, will meet againts Ian Udani. An interesting battle also. This followed by two unrated players, Abdul Haq and Najib who have scored 4/8 points so far. Let's see whether they have much energy left to conquer 2000+ and 2100+ rated players. 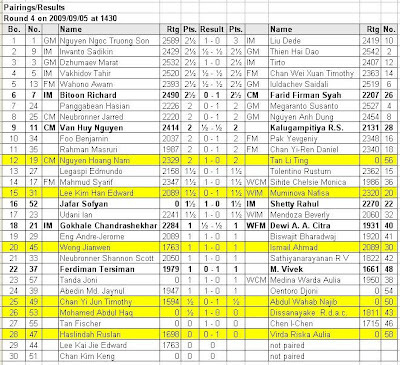 With 3/8 points, Jianwen should try to win his game againts 1900+ rated player to make sure he imroves his FIDE rating. The other three have 2.5/8 points. Ismail Ahmad will face one of the Indonesian Dream Girls, WCM Monica. Haslindah will play black againts Oentoro Djoni while Tan Li Ting will play againts a Chinese Taipeh chess player, Chen I-Chen. GiLoCatur would like to wish GOOD LUCK to all Year 6 pupils who will be sitting UPSR examination in less than 10 hours from now especially to the chess players that GiLoCatur know. All the games on the top three boards drew. It means that the two leaders from Vietnam are just half point in front of six (6) players with 5/7 points. So, the tournament is still open whereby anyone of the eight players have the chance to be the champion. 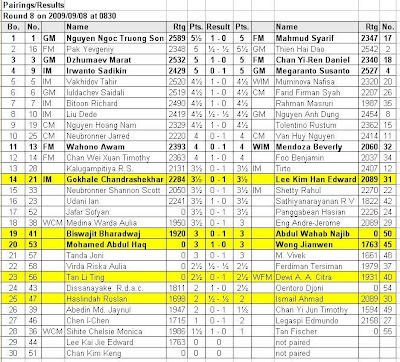 As for the Malaysian players, their respective opponents are too strong for both Edward Lee and Jianwen. 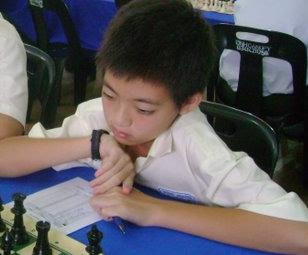 Edward was defeated by a pinoy IM, Richard Bitoon, while Jianwen had to bow to Singaporean CM Neubronner. The same goes to Li Ting where she had to accept her defeat to a Sri Lankan chess player. But it was a sweet victory for Abdul Haq and Haslindah. The unrated Abdul Haq won againts 1947-rated opponent while Haslindah defeated her higher-rated lady opponent. Whereas the unrated Najib managed to win againts experienced countryman, Ismail Ahmad. Tomorrow morning session will be interesting especially on the top four boards. Because the champion for this tournament will come from these boards. Can both FM Syarif Mahmud and FM Pak Yevgeniy stop the two leaders from Vietnam? Or would it be GM Marat and GM Susanto take the lead? Or perhaps IM Irwanto and FM Daniel Chan will be in the limelight? GiLoCatur is eager to know and can not wait the results of the tomorrow's morning session games. As for most of the Malaysian players still can achieve something. 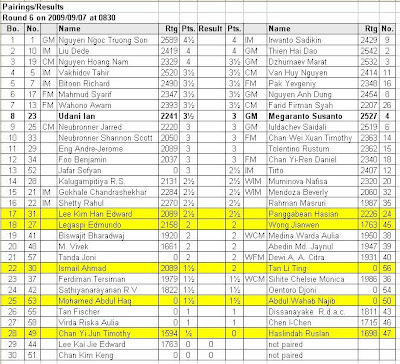 Three unrated players - an arbiter (Najib), a NWM (Li Ting) and Abdul Haq, will get FIDE ratings. Li Ting have played 7 rated players so far and will meet another rated player tomorrow morning. She has scored 2 and 1/2 points with tournament rating of 1941. 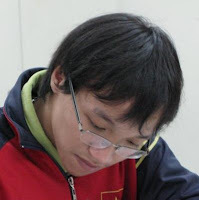 As what GiLoCatur understands, Li Ting would earn a FIDE rating in this tournament. Checking at FIDE website, she had 3 games so far with one win while playing the AmBank Challenge last year. 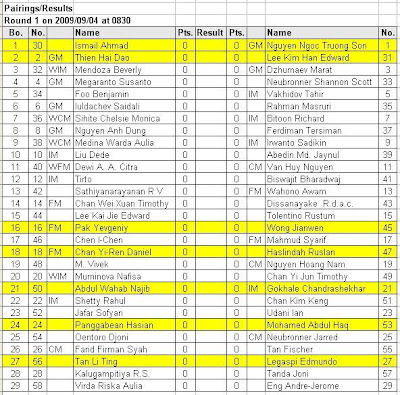 As for both Abdul Haq and Najib, they both have played againts six (6) rated players and scored 2 and 1/2 points. They might be not earning the FIDE rating yet in this tournament since not played nine (9) rated players. The most would be only eight because they meet each other in Round 6. As for both Edward Lee and Jianwen, after Round 7, their rating performance in this tournament is higher that their respective current FIDE rating. They need to maintain such performance until the last round so that their FIDE rating can increase. It would be an achievement for these young lads in pursuing their chess ambition. The two Vietnamese GMs leaders will meet againts each other on the top board in 30 minutes time. Will they draw? But GiLoCatur believes that they will fight till the end because a win is very crucial for each of them. Because three players with 4.5/6 - IM Irwanto, FM Pak and GM Marat, are waiting their chances as well. It becomes interesting when GM Nguyen Son just drew his game while his compatriot GM Dao won againts Indonesian IM, Dede Liu where both have 5/6. 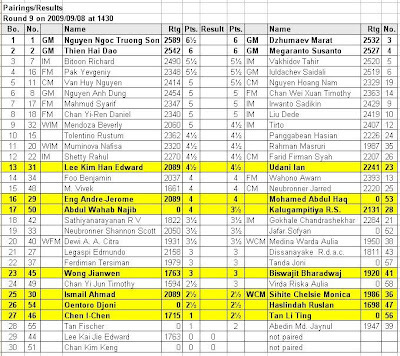 Unfortunately, Ian Udani could not manage to win againts the strong fourth seed GM Susanto Megaranto. GiLoCatur ingin berkongsi satu penemuan menarik sewaktu browsing. Satu keputusan yang agak luar biasa sewaktu Dresden Chess Olympiad ke-38 ialah keputusan yang membabitkan seorang pemain Indonesia yang bernama Yohanes Simbolon. Beliau yang unrated, telah tewas semua (4) permainan buah hitam dan menang semua (4) buah putih termasuk ke atas seorang GM bernama Nikola Mitkov yang memiliki FIDE rating 2500+. Malangnya beliau hanya seri permainan ke 9 sewaktu bermain buah putih. Jika tidak pasti ia satu keputusan yang sangat unik. 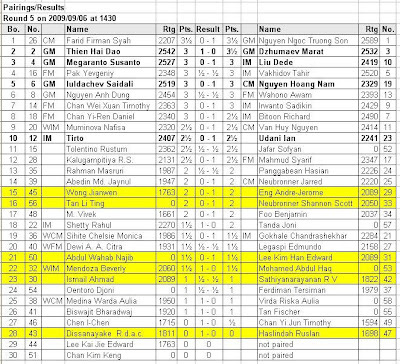 On the top board, Farid Firmansyah, one of Indonesian 38th Dresden Olympiad team members, could not continue his sterling performance when he was defeated by the top seed, GM Nguyen Ngoc Truong Son. This result with the loss of GM Marat Dzhumaev to another Vietnamese GM, Thien Hai Dao, has put GM Nguyen in front of others by half point. He needs to maintain his winning for the next four rounds to be the champion in this tournament. Could he? Let's wait and see. 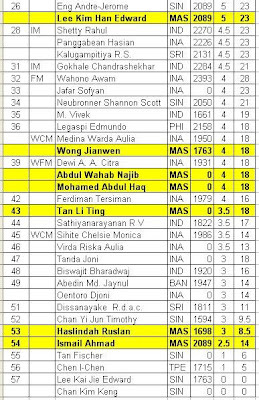 Ian Udani managed to win againts higher-rated Indonesian International Master, Tirto. 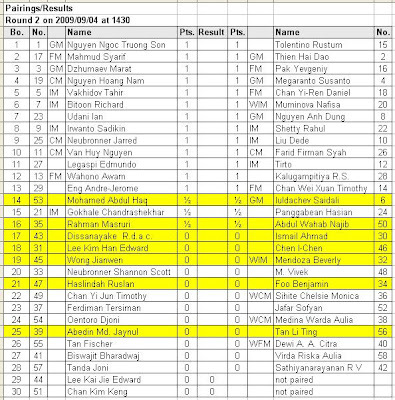 For the Malaysian camp, the results for Round 5 are not encouraging. Only Edward Lee managed to win againts another Malaysian fellow player, Najib while Sergent Ismail drew with his Indian opponent. Hopefully, good results for them tomorrow. In the sixth round tomorrow morning, four Malaysian players will play againts each other. Ismail will meet Li Ting while Abdul Haq will meet Najib. Edward Lee will play againts Indonesian player, Hasian. Jianwen's opponent tomorrow will be a higher-rated Pinoy named Edmundo Legaspi. Haslindah, on the other hand, will meet a Singaporean player. As for Ian Udani, he will have an uphill battle to win againts GM Susanto Megaranto on the 8th board. If he wins, it will be another interesting result and achievement. So, GOOD LUCK! to all of them. The top four boards drew their games in the third round played in the morning session. 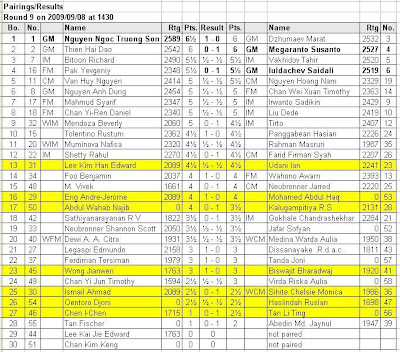 One interesting result is the draw between a below-2000 rated Indonesian, Masruri Rahman, and GM Nguyen Anh Dung, the 8th seed. It is a good result for Edward Lee who managed to draw with Tolentino Rustum whose Elo is nearly 300 points higher than him. 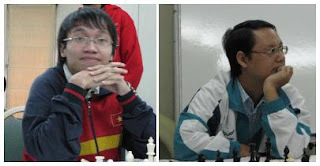 Both Tan Li Ting and Wong Jianwen won their respective games whereas the rest could not manage to win. In the afternoon session game (Round 4), both Li Ting and Edward Lee were defeated by their respective 2300+ rated opponents. On the 20th board, a junior player meet againts a senior player. Jianwen came out with a happy win againts Ismail Ahmad. While both unrated Najib and Abdul Haq are happy for winning againts their respective rated opponents - Chan Yi and Dassanayake. 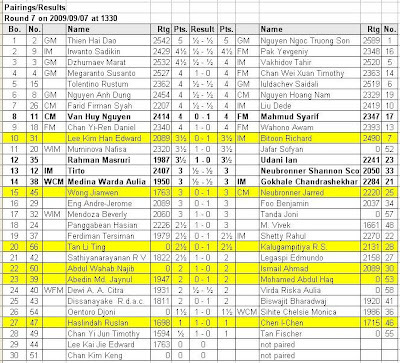 Unfortunately, the rated Haslindah lose to the unrated Virda from Indonesia. 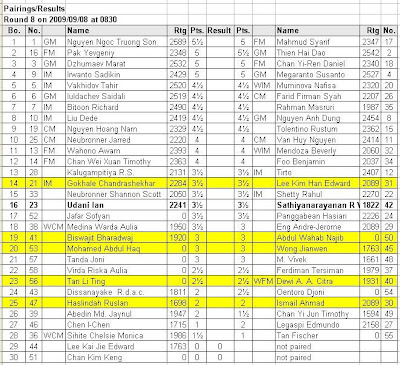 Can CM Firman Syah upset the top seed, GM Nguyen Ngoc Son on the top board tomorrow? GiLoCatur believes that whomever win the game, he would be the champion. If they both draw, it would be an open fight until the end of the tournament. It would be important games for both Jianwen and Li Ting tomorrow. If they both manage to win, their rating will soar up. There would be another Malaysian battle tomorrow between Najib Abdul Wahab (white) and Edward Lee (black). Abdul Haq will play againts a pinoy Woman International Master, Ismail Ahmad will meet an Indian player and Haslindah will play againts a Sri Lankan player. Going to the fifth round that will be played tomorrow afternoon at 2.30pm, there are three leaders with 3 and 1/2 points. The top two are GMs - one each from Vietnam (the 1st seed) and Uzbekistan (the 3rd seed). The third one is surprisingly and amazingly the 26th seed Candidate Master from Indonesia. 12 other players including the other 4 GMs are closely behind the three leaders with 3 points whereas 9 others score 2 and 1/2 points including Ian Udani. ARE WE (MALAYSIA) SERIOUS TO PUT CHESS TO GREATER HEIGHTS? 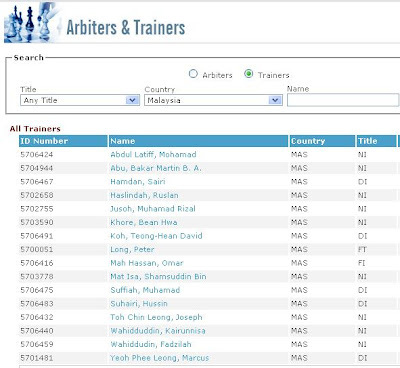 As of today, Malaysia has 16 FIDE-certified trainers and instructors in total. The breakdown is as per below. 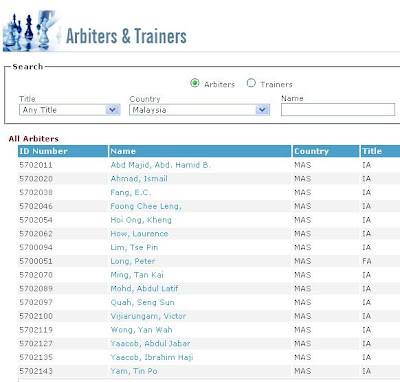 Do we also know how many certified arbiters Malaysia have? Interestingly and amazingly, as of today, the number is also 16. GiLoCatur hopes very much that below statistics of particularly Malaysia will improve and be better in the near future. Phillipines is ranked #34 in the world with avg rating of top 10 players, 2523, has 10 GMs, 25 IMs and 56 total titled. Vietnam is ranked #38 in the world with avg rating of top 10 players, 2504, has 6 GMs, 5 IMs and 69 total titled. Indonesia is ranked #59 in the world with avg rating of top 10 players, 2428, has 6 GMs, 12 IMs and 50 total titled. Singapore is ranked #61 in the world with avg rating of top 10 players, 2415, has 3 GMs, 10 IMs and 47 total titled. MALAYSIA is ranked #77 in the world with avg rating of top 10 players, 2304, has 0 GMs, 3 IMs and 17 total titled. So, let's start having more and more certified chess trainers and instructors. I do not think that we Malaysians have much problem to do so. MALAYSIA BOLEH! right?, if a Malaysian can climb mount everest, can swim across the English straits, can reach and explore the antartic and many more, to become a FIDE-certified chess trainer or instructor is a small matter. If now we have less than 20, let's target to have 30 more to make it 50 in one year time. Chess associations and clubs especially the state should have their program and target for its office bearers or members become FIDE-certified chess trainers or instructors. Aren't we serious to put chess to greater heights in this country? 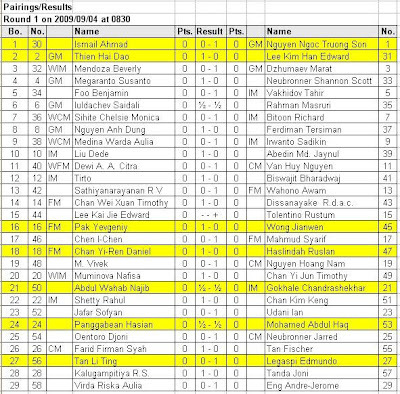 Both Sergent Ismail and NM Edward Lee managed to win againts their lower-rated opponents respectively. While the other four Malaysian players, Abdul Haq, Najib, Haslindah and Jianwen could not manage to overcome their respective opponents. Li Ting, on the other hand, makes us smile by winning againts her 1900+ rated Bangladeshi opponent. It is a good news in the Malaysian camp. Hopefully, more and more such result will follow suit. There are several game results that enchant GiLoCatur. A Vietnamese Candidate Master managed to defeat the Indonesian GM. 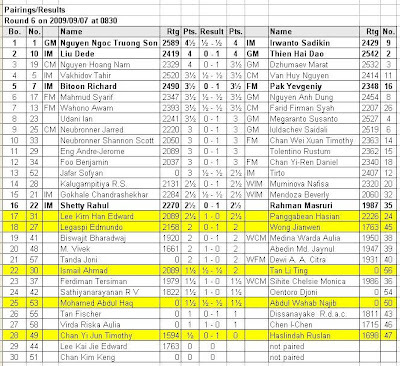 Firman Syah of Indonesia won againts higher-rated Van Huy Nguyen in the battle of CMs on the 10th board. Both WIM Nafisa Muminova and IM Shetty Rahul won againts their respective higher-rated opponents. Ian Udani drew with his GM opponent. He mentioned in his text to me that he was in winning position but he could not push further during the decisive moment. But still a draw with a GM is still a good result for him. Tomorrow, in the third round, both Ismail and Edward Lee will meet higher-rated opponent - CM Van Huy Nguyen and Tolentino Rustum, respectively. Four Malaysian players will occupy 21st to 24th board. GiLoCatur believes Li Ting, Abdul Haq and Najib have better chance over their respective opponents. 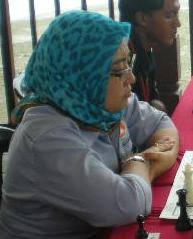 Haslindah may require more effort playing againts Indonesian puteri catur of Medina Warda. While Jianwen needs to be cautious when playing Medina's elder sister, Virda. Anyhow, as usual, BEST OF LUCK to all Malaysian players. Play your heart out! MALAYSIA BOLEH! All Malaysian players lost their games except both unrated Abdul Haq and Najib Abdul Wahab where they drew againts their respective opponents. Based on the latest national ratings, Abdul Haq is rated 1855 while Najib is rated 1698 (provided it is correct under the name of Najib Wahab, without Abdul). Another interesting result is GM Saidali Iuldachev, the sixth seed, drew with Masruri Rahman from Indonesia. The Malaysian-based pinoy, Ian Udani, also cruises smoothly to the second round with a win againts Indonesian player, Sofyan Jafar. In the second round pairing, GiLoCatur is eager to wait whether Abdul Haq could manage a draw againts GM Saidali like Masruri. Four other Malaysian players will be sitting side-by-side from the 16th board to the 19th board. Najib will meet Masruri, Ismail Ahmad will play againts Dissanayake, Edward Lee will meet Chen I-Chen, a woman player from Chinese Taipei and Jianwen will play white againts WIM Beverly Mendoza. Haslindah Ruslan will meet benjamin Foo while Li Ting will play againts Md Jaynul Abedin, a Bangladeshi player. So, SELAMAT BERJUANG & SEMOGA BERJAYA, guys! The second edition of KLCA Open will kicks off in less than 5 hours. The first round of the nine-round tournament will start at 8.30am Friday morning. 58 chess players from 11 countries will be participating where 6 GMs - 3 from Vietnam, 2 from Uzbekistan and 1 from Indonesia, and 2 strong IMs - Tahir Vakhidov and Richard Bitoon, will be the top 8 leaders to vie for the champion spot. Seven (7) Malaysian chess players will be among the participants. Seargent Ismail Ahmad will be leading the pack and in the first round, the 30th seed will play white againts GM Nguyen Ngoc Truong Son of Vietnam on the top board. What an uphill task for the FIDE 2089 rated player againts the 2589 rated young Grandmaster. On the second board, NM Edward Lee (FIDE 2089) will play black againts another top Vietnamese GM, Thien Hai Dao, another 2500+ rated player. Let's all we Malaysians pray and hope they will produce excellent and gallant fight. It is a surprise for GiLoCatur seeing Abdul Haq as one of the participants since he is not that very active in chess tournaments lately. 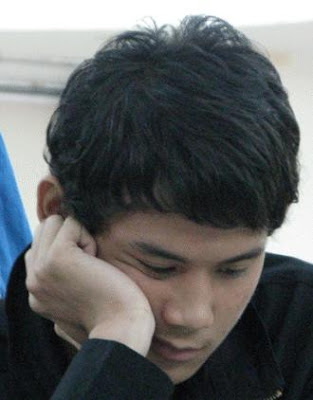 In the first round, he will play black againts a 2200+ Indonesian player, Hasian Panggabean, the 24th seed. Considered a strong chess player, GiLoCatur believes Haq has an equal chance to win the match. Representing the Malaysian ladies, Haslindah Ruslan, has to battle againts a Singaporean FM, Daniel Chan Yi-Ren, the 18th seed in the first round. Hopefully, she manages to improve her FIDE rating and win as many games as possible againts higher-rated opponents. Her participation in this tournament hopefully will motivate and encourage more Malaysian chess women to be active and participate in FIDE-rated chess tournaments. GiLoCatur is very happy to see the determination and will of young Malaysian chess players like Wong Jianwen. He just participated in the recent DAT Malaysian Open. Kudos to him! With many exposure and participation in international chess tournaments, he will surely improve and succeed in the future. Who knows, Jianwen will be among our future Grandmasters and GiLoCatur believes strongly he could. In the first round, his opponent is a Kazakhstan FM, Yevgeniy Pak (FIDE 2348). Hopefully, he will learn a lot from such valuable experience and game encounter. Go Go Go Jianwen! 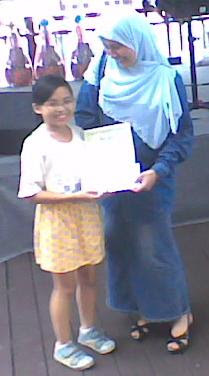 NWM Tan Li Ting is the sole representive for Under12 players and young Malaysian girls. WCM Nabila and Fairuz Hamizah, the daughter of Cikgu Fuad, will be busy next week with their UPSR examination. 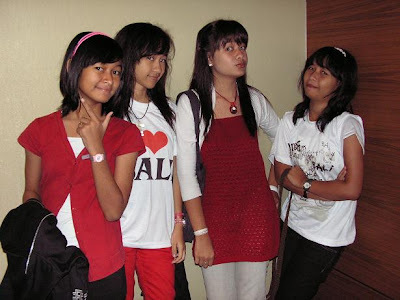 So, let us put our hope on this talented girl to be at par with or even surpass the Indonesian Dream Girls - WFM Dewi A A Citra, WFM (stated WCM in the starting list) Medina Warda Aulia, WCM Chelsie Monica Sihite and Virda Rizka Aulia, the elder sister of Medina. The exposure of playing in a quality chess tournament like KLCA Open surely will help Tan Li Ting to go further in her chess ambition. SO, all the rakyat Malaysia, let's support and cheer for the above seven Malaysian chess players to play gallantly and excellently in the chess tournament. If we want chess to achieve greater heights let's show our strong support to these seven fighting Malaysian chess warriors by giving good luck wishes and greetings to them. Let's show to our Youth and Sports Minister also how determine and serious we are in promoting and supporting chess in this country. You all can do that by writing in the comments or in the shoutbox. Let's start the ball rolling folks! For most active chess players they already know and understand what a chess rating is. But many especially the parents whose children just started participating in chess tournaments do not really know what a chess rating is and understand how it is derived or calculated. So, basically today GiLoCatur wants to share the knowledge with them. When talking about chess, you might hear statements such as "I'm a 1600 player," or "we're playing in the under 2000 section." These numbers being thrown around are called chess ratings, and are an important part of the chess community. Ratings are numbers used to represent the playing strength of chess players. Most rating systems are based on the work of Arpad Elo, and are known as Elo rating systems. The internal workings of chess rating systems can be quite complex, but the basics are simple. Ratings are based on the results of of games between players -- usually, games played in chess tournaments. If a player wins games, his rating will increase; if he loses games, his rating will decrease. The rating of a player's opponents also effect how that player's rating will change. Defeating a much lower-rated opponent will cause a gain of few (if any) rating points, while defeating a much higher-rated foe will earn a large number of rating points. Losses work the game way, though in the opposite direction; losing to a much stronger player won't effect a player's rating much, but losing to a weaker opponent will cost quite a few points. Draws also effect ratings in a similar manner (drawing a higher-rated player increases ones rating, while drawing a lower-rated player decreases it), though not as dramatically. Over time, a player's rating should approximate their skill level, allowing players to compare themselves to their peers. As a player improves, their rating will tend to rise. What do Chess Ratings Mean? Ratings vary depending on who is issuing them. In terms of United States Chess Federation (or USCF) ratings, a complete beginner who has just learned the rules of chess would likely earn the minimum rating of 100. The average scholastic tournament player has a rating of around 600. A "strong" non-tournament player, or a beginning tournament player that has gained some basic experience might have a rating around 800 or 1000. 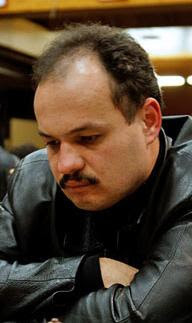 The average adult tournament player in the USCF is rated around 1400. Very strong adult tournament competitors -- the top 10% or so of that group -- are rated over 1900. Prestigious titles are available to the strongest players. These titles are usually award partially or entirely based on ratings. Experts are players with ratings over 2000. Masters are players with ratings over 2200. Earning the International Master or Grandmaster title requires more than just a high rating, but these players are typically rated over 2400 and 2500, respectively. The best players in the world are rated over 2700; the highest rating ever achieved was 2851, by former World Champion Garry Kasparov. How do Players Earn Ratings? A chess rating can be earned in a variety of ways. Online chess sites often offer their own ratings, which are useful for finding appropriate opponents while playing online. Some chess clubs also keep their own informal ratings. When most people speak of chess ratings, however, they are speaking of ratings assigned by a national chess federation (or by FIDE, the International Chess Federation). These ratings are earned by playing in sanctioned tournaments. After each tournament, the results are sent to the federation rating the event, where they are processed and used to update the ratings of the competitors. For Malaysia, basically we have our own national rating. Normally, the national ratings is maintained by the authorized ratings officer. It will be calculated every quarterly or three months. The latest one is July 2009. Go to this link to check on the national rating or you can download it in MS excel format here. GiLoCatur is very happy when reading an article related to chess in a local Malay newspaper, Sinar Harian. The Minister of Youth and Sports has given a promise for chess in this country. He had officiated the ASTRO Merdeka Rapid Teams championship held in Mid Valley recently. KUALA LUMPUR - Menyedari sukan catur kini semakin diminati ramai, Kementerian Belia dan Sukan (KBS) bersetuju untuk mengatur program pembangunan bagi memperkasakan sukan itu di negara ini. 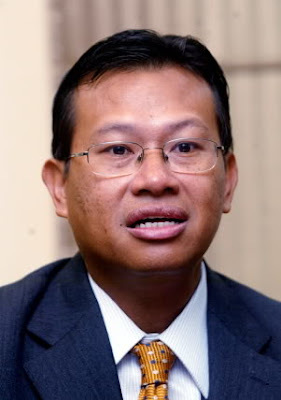 Menteri Belia dan Sukan Datuk Ahmad Shabery Cheek berkata, sebagai langkah awal membangunkan sukan itu, KBS akan berbincang terlebih dahulu dengan Persekutuan Catur Malaysia (PCM) bagi mengenal pasti langkah terbaik untuk merangka program pembangunan. “Langkah awal yang perlu dibuat adalah untuk melahirkan seorang ‘grandmaster’ catur yang mempunyai potensi untuk mengharumkan nama negara di peringkat antarabangsa,” katanya. Beliau berkata, publisiti terhadap penganjuran sukan seperti itu perlu dipertingkatkan agar sukan catur dikenali oleh seluruh masyarakat di negara ini. “Apa yang paling penting untuk memajukan sukan ini ialah dengan menarik orang ramai menonton sukan ini. “Contohnya sukan boling dan kriket yang dahulunya dianggap membosankan kini mendapat tempat apabila perubahan daripada segi peraturan pertandingan dan tempoh masa diubah sesuai dengan penerimaan orang ramai,” katanya. Ahmad Shabery berkata, pihaknya akan cuba menghulurkan bantuan daripada segi pencarian bakat dan sumber kewangan untuk membolehkan PCM menganjurkan lebih banyak pertandingan peringkat kebangsaan. 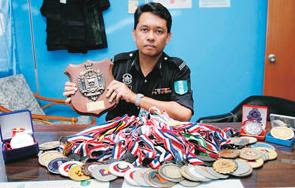 Beliau berkata, persatuan sukan tidak seharusnya mengambil sikap lepas tangan ekoran bantuan kewangan, sebaliknya perlu berusaha mencari penaja. (The above reminder is very critical for all sports associations to look for their own sponsors for the development of the sports including providing the fund for selected players to participate in quality and world class tournaments and championships abroad). Sementara itu, Presiden PCM, Tan Sri Ramli Ngah Talib menyambut baik kesediaan KBS untuk memperkasakan sukan catur di negara ini. 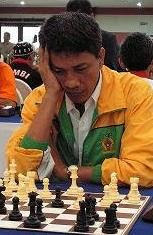 “Saya harap usaha KBS untuk membangunkan sukan catur di negara ini akan mendapat sokongan semua pihak dan PCM sentiasa menyokong usaha ke arah ini dan kita juga harap mampu lahirkan seorang ‘grandmaster’ catur suatu hari nanti,” katanya.